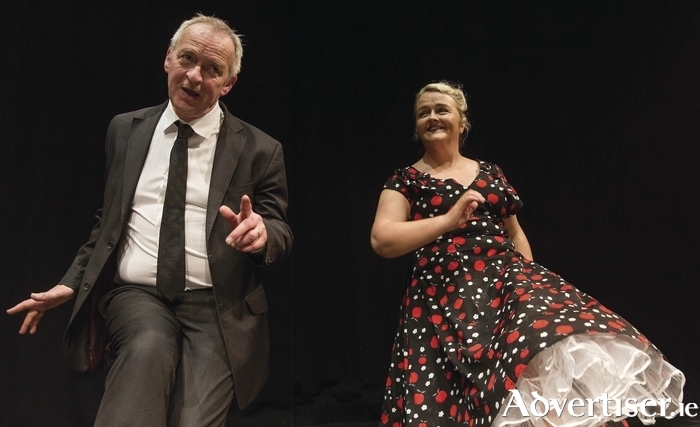 INTERNATIONAL HIT play, Swing, a beguiling comedy about dance, music and love hits the Town Hall Theatre on Friday April 1 at 8pm. Produced by Dublin’s Fishamble Theatre Co, it won the Bewley’s Little Gem Award at the 2013 Dublin Fringe Festival, and has been performed in New York, Paris, Edinburgh, and New Zealand, and is scheduled to go to Australia after its current Irish tour. Swing was written/devised by actors Janet Moran and Steve Blount along with Fishamble dramaturg/writer Gavin Kostick and director Peter Daly. “Fishamble run this fantastic initiative called Show in a Bag, run with the Fringe Festival and Irish Theatre Institute,” Daly tells me. “It’s about enabling actors to tell a story they have always wanted to tell. Janet had this idea for a play where two people meet at a swing-dancing class because she had been taken out on a fantastic dance night with Steve Blount about 15 years ago. She always thought there was a show there somewhere and it had been on her mind. "After talking to Gavin she went back to that idea and approached Stevie about applying for the Show in a Bag scheme and they did and were successful. They then got me on board as director and after that we all wrote it together, it was a very collaborative process. We’d do whatever was needed each today like ‘we need a scene where these two people meet, a dance class scene’, we’d do a lot of improv and devising and stuff like that and then gradually pull the show into shape. Daly expands on the play’s central characters, Joe and May; “Joe is in his early fifties and May is in her late thirties. May is in a relationship with a guy she describes as absolutely lovely but you can tell that there isn’t much of a spark between them. He is away working abroad for three months so she decides to go to the dance class. Her first one is a disaster, she can’t get the steps, she is trying to lead when she shouldn’t be. But this older guy, Joe, is really nice to her. "He has this philosophical, gentle way of looking at the world and at dance and he persuades her to stick around and give it another go and she dances with him. Joe has been in a relationship which has ended, his kids live overseas. He had a business which has failed but despite all these things he remains positive. As well as the top-notch acting and winning story, Swing is also buoyed along by a great music score featuring music from the thirties to the fifties. It should adds up to a great night’s theatre. Page generated in 0.0869 seconds.